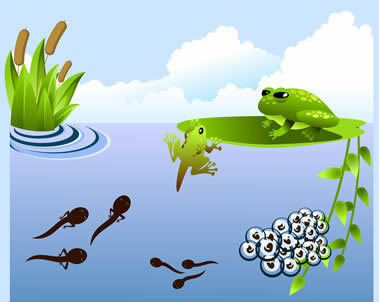 Articles and pictures about the Life Cycle of a Frog including tadpoles,types of frogs, fun facts, anatomy, more. Your #1 source of info on the FrogLife Cycle! The life cycle of a frog starts when mom and dad frog fall in love and decide to have baby frogs. Okay, nobody really knows if frogs fall in love, but it's okay to think that they do. Mom and dad frog will mate, either in the water or in a tree, depending on what kind of frogs they are. You know this is happening when you see dad frog hugging mom frog from behind her. The dad frog will lay on top of mom frog and wrap his front legs around her body and he will hug her for several days. This hug is called amplexus. While mom and dad frog are hugging, mom frog will lay a bunch of eggs for the dad frog to fertilize. 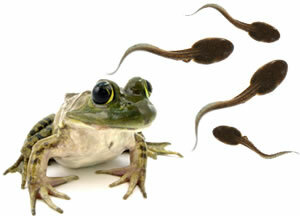 Unlike human eggs, frog eggs are fertilized by dad frog when they are outside of the mom frog's body. This is called spawning and is the very beginning of the frog life cycle. After the mom and dad frog have finished spawning, dad frog leaves, and sometimes the mom frog does, too. Sometimes mom frog will stick around, though, and wait for the baby frogs to hatch so that she can care for them, but this only happens with some breeds of frogs, not all of them. Mom frog will lay a whole bunch of eggs because most of them won't hatch. Some of the eggs will be eaten by other small animals and birds, and some of them won't become fertilized. Other eggs might become dried up in the sun or get broken in the water. The eggs that survive will hatch after about 7 to 9 days and begin the frog cycle and start the many life stages of a frog. But they don't get to be frogs just yet; they have to go through the tadpoles' life cycle first. When frog eggs hatch they don't come out as frogs right away, they have to start out as tiny little fish-like creatures called tadpoles. In the beginning 7 days or so of tadpole development, a tadpole will eat the egg yolk that is still left in its gut. The only parts to the baby tadpole are the gills, the tail, and the mouth. After about 7 days of tadpole development, the tadpole will begin to swim around on its own and eat algae from the top of the water. About four weeks into the tadpoles life cycle it will begin to grow teeth and skin over the gills and will begin to become social and swim in schools like fish. Then 6 to 9 weeks into the tadpoles development it will begin to grow longer and develop a little bit of a head and some legs. At the end of the 9 weeks, the tadpole will look more like a frog than a fish, but with a long tail. The tadpole will also start to eat things like tiny insects. In areas of the world that have cold winter months or that are in very high altitudes, which also are sometimes very cold places, the tadpoles life cycle takes all winter long to complete. From 9 to about 12 weeks, the frog metamorphosis starts to really take shape. The tadpole that looks like an itty bitty frog but with a long tail (called a Froglet) will lose most of its tail, grow a frog tongue, and start to really look like a baby frog. 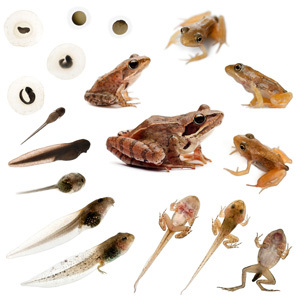 The whole frog life cycle model is completed after about 16 weeks when the frog becomes an adult. If you wanted to draw a diagram of frog life cycle, you might make it look like a circle, starting with eggs, and then the baby tadpole. Then you would add legs to the baby tadpole and call that a 'Froglet'. Then draw a full grown frog, which points back to the eggs because the life cycle of a frog doesn't end with the full grown frog. The full grown frog will find a frog to love and to make more baby frogs with and begin the frog life cycle all over again. What's the difference in a toad and frog life cycle? Actually, toads are frogs. Toads are just called something different because they look a little different, but they are all part of the frog family. Lots of people want to know what the difference is between a toad life cycle and a frog life cycle. Mostly it's the way that the eggs are laid and the way that the skin develops. The frog eggs are laid in clumps and toad eggs are laid out in strands or lines. The skin of a frog will develop into slimy skin and the skin of a toad will develop into warty skin, which is why people think that toads can give you warts. But if toads can give you warts, why don't frogs make you slimy? So, if you were going to grow a frog, where would you start? Would you start with a tadpole or with an egg? I bet you said egg. But remember that most of the eggs won’t live, so how do you know that you have a living egg? Maybe starting with a tadpole would give you better luck when you are trying to grow a frog. Or, maybe you should start with a mom and a dad frog. But then you might grow a hundred frogs and they would take over your whole room and turn your walls green and sing you to sleep every night croaking… Okay, that’s another story! Start with a tadpole and you will be able to watch the whole, very cool, frog metamorphosis.